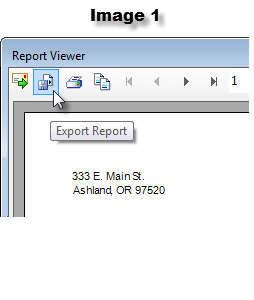 Click the Export Report icon (second from left at top) for a Standard Report (Image 1 below), or the Export button (third from left at bottom) of the Data Viewer screen (Image 2 below). Select the type of output file desired. For a report, select the “save as type” for the file type desired. For Data Viewer, click the down arrow to the right of “Export”, and select the file type desired. For Data Viewer screens: Choosing “Export as CSV” (comma separated values) will give you data with the least amount of formatting and is easily imported to Excel. For Standard Reports: Selecting “Microsoft Excel…Data Only” will give you similar formatting to CSV.